Living in San Francisco, you're bound to have a love/hate relationship with Tartine Bakery. Love for all of the obvious reasons: most amazing morning bun, fabulous fruit tarts, and decadent chocolate desserts. Anything lemon. Almond croissants to rival Parisian patisseries. Strong coffee. So what's to hate? Weekend crowds and tourists--the fact that it's tough to squeeze in for that morning bun on a Sunday in any kind of sane manner. 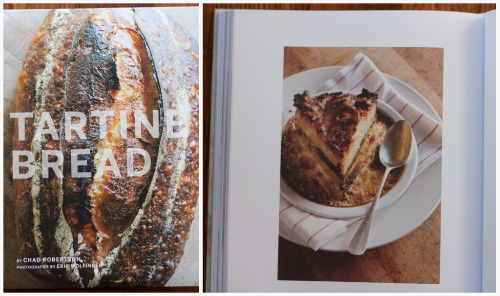 Thankfully then, for weekend mornings when you can't muster the energy to elbow your way through the lines, we have the Tartine cookbooks (the first of which is aptly named Tartine). Now I very rarely write to publishers directly asking for a review copy of a book, but I did for Tartine's newest cookbook, Tartine Bread. I'd been awaiting its arrival ever since I heard that co-owner and bread master, Chad Robertson, was working on it. Chronicle Books was kind enough to send over a copy, and I stayed up and read it from cover to cover that evening. It's absolutely lovely. It's informative, it's inspiring, it's visually stunning. Chad gives you step-by-step instructions, guiding you (in pedestrian terminology) through the process of making his Basic Country Bread and Eric Wolfinger (who used to bake bread at the bakery) walks you through each step with his almost tactile, moving photos. It is as I knew it would be: a very special book. From the get-go, Chad knew that the photos would be a critical part of the book because "traditional, intuitive bread making does not lend itself naturally to a written recipe." In addition to written instructions, someone needed to show readers how to make the bread--Eric Wolfinger has succeeded ten times over. Of the visual nature of the book, Chad notes, "Learning a craft is as much about copying as it is about understanding, as much visual as it is intellectual." From a quick glance at the cover of the book, you're already in Eric's world and as you flip to the first page, Chad takes your hand. You're now ready to bake bread. The first 87 pages are devoted to a brief history of the bakery, the evolution of making and selling bread, and the detailed recipe for Chad's Basic Country Bread. In broad terms, he notes that "the goal of making bread with a satisfying depth of flavor, a good crust, and a moist, supple crumb is a constant." In more specific terms, the recipe for the Country Bread begins with a natural yeast starter, often called sourdough, although Chad promotes using a "younger" leaven which gives the bread much more of a subtle flavor. He explains that the concept dates back to before the 1930's when French bakers would use natural leaven in their baked goods--before the days of commercial yeast. Now if you tend to be one of those bakers who feel yeasted breads are a big enough leap and can't imagine making your own leaven, heed Chad's words: "The substantial gains in savor, keeping qualities, and versatile uses with the natural leaven justify the time it takes to build and care for one." And he should know. Chad spent over two decades apprenticing with artisan bakers in France and in the United States, and experimented with his own ovens out in West Marin and in Mill Valley. In 2002, he moved to San Francisco with his wife (and other half at Tartine Bakery), Elizabeth Pruitt, to create the legend that is now Tartine Bakery. The rest is history. And readers get a glimpse into that history with each page of Tartine Bread. After Chad's basic bread recipe, the book branches off into interesting variations (olive bread, walnut bread, pizzas). And the last half delves into other recipes mainly using day-old breads such as French Onion Soup, Meatball Sandwiches, and Tartine's Baked French Toast. While I haven't yet had time to make Chad's Basic Country Bread, I wanted to dive right in, so I made the Panade using rustic bread I had lying around the house. If you're not familiar with Panade, the headnotes for the recipe explain that it's a basic french preparation similar to the Spanish sopa seca, or "dry soup." Or if you're familiar with the Italian ribollita--same thing. The foundation is always dry bread moistened with water or stock and any combination of vegetables, greens, and cheese you have on hand. While it sounds a lot like bread pudding, the recipe doesn't call for any eggs so it's actually best after setting and retaining its shape two or even three days after it's made. You slice it in wedges to serve and reheat it. The Panade recipe is straightforward and relatively quick to put together. I've reprinted it here with permission from Chad Robertson and the folks at Chronicle Books. At the end of the recipe, you'll find a few personal notes and words of advice for a successful panade. Next time I want to make it with Chad's bread--that is, if there are any day-old slices remaining. Which, somehow, I doubt. Preheat the oven to 375 F. Melt 1 tablespoon of the butter in a saucepan over medium heat. Add the leeks and saute until softened, about 5 minutes. Add 2 cups of the milk, the remaining 5 tablespoons butter, and 2 teaspoons salt. Bring to a boil and them remove from the heat. Cover the bottom of a deep, heavy, 5-quart pot with 2 or more slices of the bread. Arrange the squash slices in an even layer on top of the bread and pour in 2 cups of the hot milk mixture. 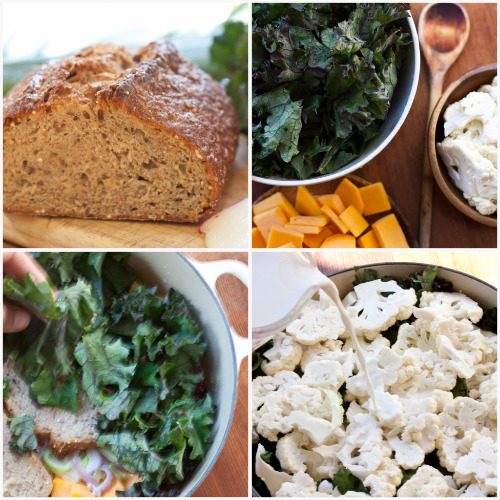 Top with remaining 2 bread slices and then with the kale. Arrange the cauliflower slices over the kale. Press the ingredients down to compact them if they don't quite fit in the pot. Pour the remaining 4 cups milk mixture over the vegetables and bread. Stop adding the milk when the level is almost to the rim. Season with salt. Cover the pot with the lid or aluminum foil. Bake for 30 minutes. Uncover and arrange the cheese over the top. Cover, return to the oven, and bake until the liquid is absorbed and reduced, and the cheese has melted and browned, about 20 minutes. When the panade has cooled, it should appear dry. 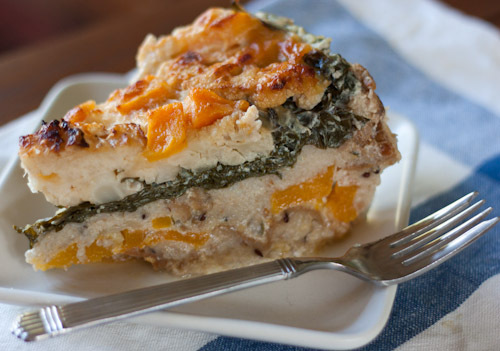 Serve immediately or let cool and refrigerate for up to 3 days. To reheat, cut the panade into wedges and put on individual ovenproof plates. Pour 1/4 cup cream over the top of each wedge and bake for 15 to 20 minutes in an oven preheated to 375 F.
My notes: I used a bit more bread than the recipe called for just to cover the width of my pan. I also found that the panade needed an extra 15 minutes in the oven and I ended up taking off the lid for the last 30 minutes. I found this helped the top crisp up nicely.